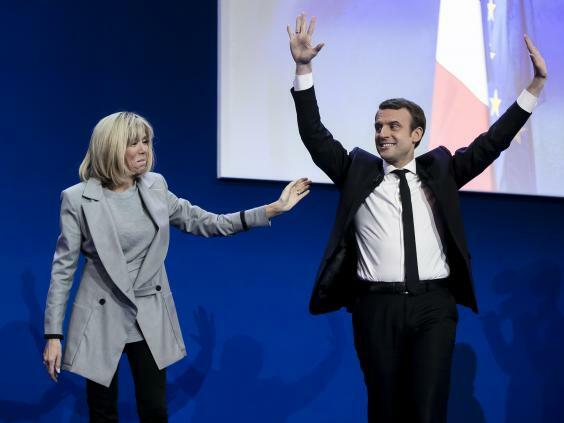 The monogamous relationship between Mr Macron and a wife 25 years his senior might seem staid by the standards of some unfaithful French presidents. They walked hand-in-hand into the victory rally, embraced and kissed on stage: Emmanuel Macron, winner of the first round of the French presidential election, and his elegant blonde wife Brigitte. At the lectern, the man now expected to beat Marine Le Pen in round two – despite not having had a political party until starting the En Marche! movement a year ago – made sure to thank all those who had helped him get so astonishingly far. It was to any English observer who knew the back story, a charming reminder that if he wins the final round in a fortnight’s time, Mr Macron will continue the fine French presidential tradition of having a love life to boggle and amuse stolid Anglo-Saxon minds. Aged 64, Ms Macron is a grandmother-of-seven and 25 years her fresh-faced 39-year-old husband’s senior. Even better, perhaps, they met when he was 15 and she was his married, private school teacher - with a daughter of the same age, in the same class. It is said that Brigitte’s family, the Trogneux, respected chocolatiers in the northern French town of Amiens – (coincidentally now specialising in macarons) – did not immediately approve of the relationship with Mr Macron. At one point, according to a local journalist with a long memory, the love affair created a “pure scandal”. Impressive, by English standards, but it has to be said that the rather less racy reality – as presented by the Macrons and those close to them – is perhaps far too monogamous, and probably a little too Mills and Boon to qualify Mr Macron for the Panthéon of French presidential greats. So far, Macron would struggle to beat even the Elysée’s current occupant, Francois Hollande, whose policies were hardly a roaring success but who added greatly to the jollity of the nation by being photographed, face hidden behind his scooter helmet, visiting the apartment of an actress 17 years his junior. The resulting end of his relationship with official partner Valerie Trierweiler (nicknamed the rottweiler) did at least mean the short, bespectacled Mr Hollande dared appoint to his cabinet Ségolène Royal, the mother of his four children, whom he had left for Mme Trierweiler. And yet the French nicknamed him Monsieur Normal – probably fairly, because Hollande’s reputation as a ladies man is nothing compared to that of Valerie Giscard d’Estaing, who shortly after being elected in 1974 was involved in a dawn collision with a milk float while driving home a woman who wasn’t his wife.